Lock in a great price for Gästehaus Kleiner Muck – rated 8.8 by recent guests! Very nice owner. Delicious breakfast with a Lebanese twist. Parked right outside on the street. 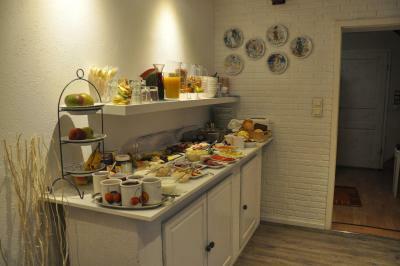 Charming hostess, well designed room and fabulous breakfast with many choices - all special and delicious. 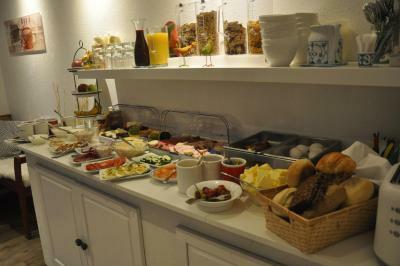 I was given an even nicer room than the one I had booked, breakfast was great, friendly staff. Good bicycle parking. Very friendly and accommodating. Easy to talk to because the owner spoke English which has not been common in this area. 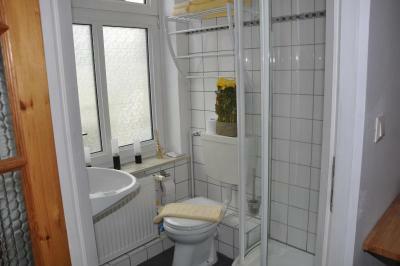 The decor is very individual and German, will appeal to many. Centrally located, just a few footsteps from the market place and restaurants and close to a park which was nice for walking the dog. We had booked a normal double room but stayed in the top floor appartement without extra cost. There was a separate lounge with a kitchen including everything you would need even for a longer stay. Big flat screen television and fast wifi connection. Great breakfast with lots of choice. 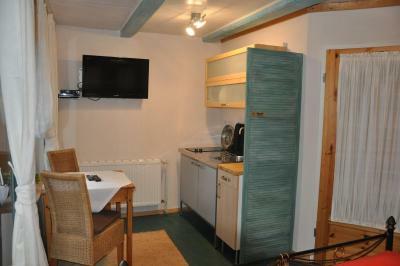 Comfortable bed, parking of bikes in a garage, helpful staff, very nice location with many restaurants around. Very kreative and fine rooms. Also the garden is wunderfull. Friendly welcome; helpful staff; English spoken; clean, though small, room; separate shower (nice and hot) and bath in good sized en suite bathroom. 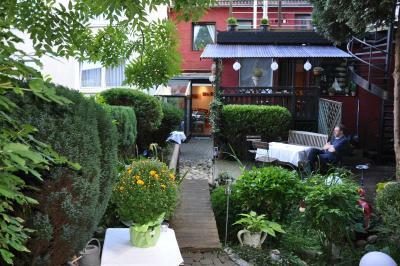 Located in Glückstadt, Gästehaus Kleiner Muck has a garden. 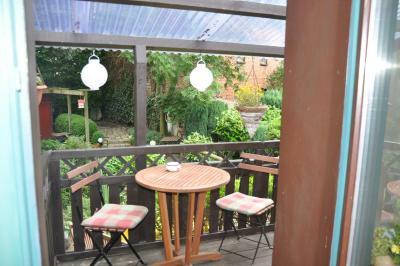 Some rooms at the property feature a terrace with a garden view. At the guesthouse, all rooms have a desk. 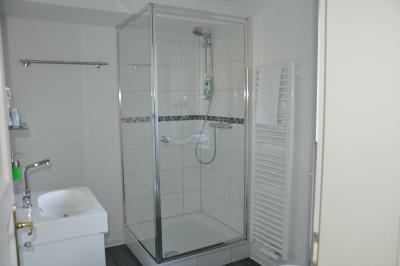 Rooms are equipped with a private bathroom with a bath or shower and selected rooms are equipped with a balcony. All guest rooms include a closet. Cycling is among the activities that guests can enjoy near Gästehaus Kleiner Muck. Stade is 23 miles from the accommodation. The nearest airport is Hamburg Airport, 39 miles from Gästehaus Kleiner Muck. 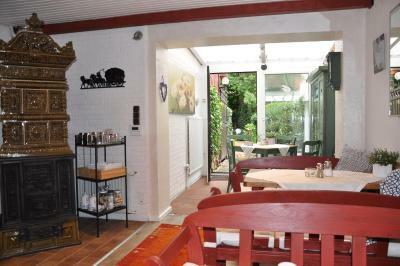 This property also has one of the top-rated locations in Glückstadt! Guests are happier about it compared to other properties in the area. 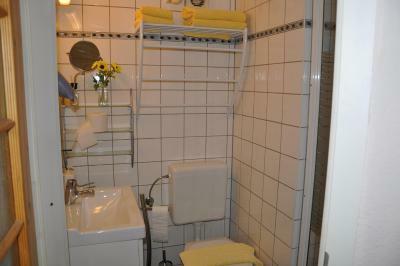 When would you like to stay at Gästehaus Kleiner Muck? House Rules Gästehaus Kleiner Muck takes special requests – add in the next step! Location, vfriendly landlady, room was nice. Noise until midnight from kebab shop across the street. Next time will request room overlooking the garden. Parking is in front of the house, and no parking were allowed until 18.00. Be aware that you need to call them to check in. Bed was small and too soft. Owner was not there when we arrived and we had some issues with bike storage which had to be sorted over the phone. We had pre-warned them about the bikes but they hadn't communicated to us that there would be a problem. We had to leave them in a neighbouring yard which was not good. If we hadn't had already paid we would have gone elsewhere. The top floor appartement will probably get very hot on a warm, sunny summerday. We had to wait for our breakfast tea for quite a while.